SOA Watch is an independent organization that seeks to close the U.S. Army School of the Americas (SOA), under whatever name it is called, through vigils and fasts, demonstrations and nonviolent protest, as well as media and legislative work. Founded by Maryknoll priest Fr. Roy Bourgeois in 1990, SOA Watch will celebrate 25 years of existence in 2015. On November 16, 1989, six Jesuit priests, their co-worker and her teenage daughter were massacred in El Salvador. A U.S. Congressional Task Force reported that those responsible were trained at the U.S. Army School of the Americas (SOA) at Ft. Benning, Georgia. This day was ‘’the Kairos moment’’, said Fr. John Dear, a Jesuit who participated in a first vigil that day. It was just the beginning of hundreds of protests and vigils for peace. In 1990, SOA Watch began in a tiny apartment outside the main gate of Ft. Benning. While starting with a small group, SOA Watch quickly drew upon the knowledge and experience of many in the U.S. who had worked with the people of Latin America in the 1970’s and 80’s. 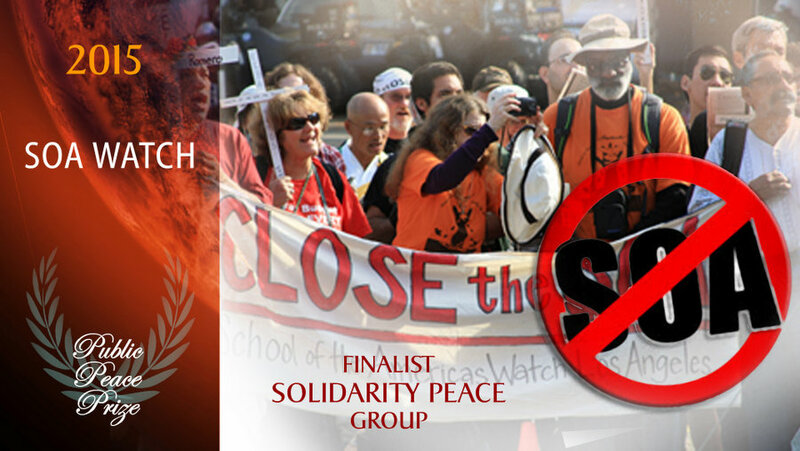 Today, the SOA Watch movement is a large, diverse, grassroots movement rooted in solidarity with the people of Latin America. There are currently five full-time SOA Watch staff members. The SOA is a combat training school for Latin American soldiers, located at Fort Benning, Georgia. In 2001 renamed the Western Hemisphere Institute for Security Cooperation. Since 1946, the SOA has trained over 64,000 Latin American soldiers in counterinsurgency techniques, sniper training, commando and psychological warfare, military intelligence and interrogation tactics. These graduates have consistently used their skills to wage a war against their own people. Latin America, as many places on earth, is in need of building stronger networks for peace and to protect democracy. This is part of the attempts by SOA Watch which also seeks greater recognition and participation in these efforts. Solidarity is a line of North/South work that jointly succeeds in setting out the grounds for expanded peace and in avoiding constructing further grounds for conflicts. SOA Watch does wonderful work educating Canadians and Americans about the terrible history of the School of the Americas and its controversial curriculum. Particularly famous is their discovery of a manual used at the school for training in interrogation methods (torture). Each year SOA Watch brings together thousands of teachers, farmers, students, unionists, and environmentalists at the gates of the School of the Americas. For several decades, Roy Bourgeois has been actively advocating human rights in a heavily militarized society. His passion for social justice is rooted in the option for the poor and the oppressed inspired by Gospel and the Liberation theology developed in Latin America. He is a role model practicing non-violent solidarity. SOA Watch is a great choice. For sheer persistence they are at the “head of the class”. And, they are taking on more than just the SOA (although this is a fitting symbol for everything that is wrong, especially in the western hemisphere. They are taking on the whole imperialistic policy of the US toward all of Latin America and the Caribbean, immigration issues, and the ‘drug war’ as an arm of US imperialism.